The summer heat has engulfed the whole of Zimbabwe’s landscape but not as hot as it feels when you get to Zhombe in Kwekwe District of the Midlands province. In this sweltering heat, the people in the area have totally given up hope that they will ever have good farming season or favourable climatic conditions that would ensure a reasonable harvest. In this heat, the people of Zhombe are quite welcoming and once you engage them, especially after identifying yourself as a journalist, they easily open up. They have a tale to tell and are convinced that tale is behind their misfortune. For them Zhombe has been cursed and will never give them a good harvest. They believe that their area was cursed by the spirits because blood that was spilled in Zimbabwe’s infancy. Remember the dissident era in early 1980s. Since then the area has not received enough rains and hunger has become part of the area history. Dams, rivers and boreholes have dried out while heat seems to be increasing by day. Villagers now pin their survival on Government and non-governmental organisations for food assistance. For water they have to scrounge around. The area is associated with the most intriguing story of the late Richard Gwesela, a notorious dissident, who terrorised the Midlands province shortly after independence and before the signing of the Unity Accord in 1987. Unfortunately for the people of Zhombe, Gwesela’s history is so obscure that even the people in the area do not believe that the security personnel killed the right man. They actually believe the man vanished. Many people in Zhombe believe that Richard Gwesela is still alive. The talk is that he skipped the border when the heat from security forces mounted and sought refuge in South Africa where he is living a normal life out of crime. “No one in the area saw his body and even if you check with the family they would never show you where Richard was buried. 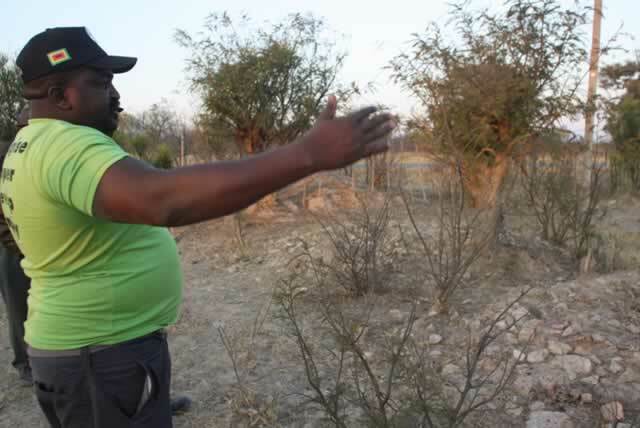 Some even believe that the family agreed that the authorities had killed Gwesela because it had gone through a lot during his reign of terror. “The general feeling is that the mother was afraid that she would be tortured. She identified the bullet- riddled body as her son’s for fear of continued victimisation by the people and security forces who combed the area daily. “Despite the identification of Gwesela’s body nothing has been confirmed since that day in 1987,” said one of the villagers who lives near the famous Joel Shopping Centre. The then Home Affairs Minister Enos Nkala broke the news on September 18, 1987, that Gwesela, the notorious dissident, had been killed by security forces in the area. The late Minister Nkala said Gwesela was shot dead together with three of his colleagues by the security forces at Chemagora communal lands. Another dissident was carried away by his colleagues after suffering serious injuries in the exchange. The current Chief Gwesela, while dismissing reports that the notorious bandit was still alive either in Zimbabwe or South Africa, added that in his opinion Richard Gwesela was not a member of the family. “His mother, who was married to one of the Gwesela clansmen, in a polygamous family, came with her first born child Richard who was not of the clan. “He was not from our family but he was looked after as one of the children,” he said. Chief Gwesela said Richard was known for his dubious character as grew up. “The elders questioned his character as he grew up in the village but always attributed it to wherever he was born. “He joined the Zipra forces in the liberation war in 1976. When he returned from the war he had not reformed hence he continued with his bad behaviour and joined the dissidents,” Chief Gwesela said. Since the family was not aware of his background or his real father, he said, they were forced to endure a torrid time when Richard launched and masterminded his reign of terror. Chief Gwesela said Richard left seven children from different mothers after he was killed. Richard Gwesela’s mother, Mrs Magubane Ndumo, died in 2006 with her secrets and the family did not bother to look for Richard’s original roots. Mr Ndebele’s sentiments were also echoed by another village elder, Mr Nobert Gwesela, who narrated how at one time the family were detained for assisting and abetting the dissidents. According to records, Gwesela’s reign of terror started early in 1987 when he and his gang killed four farmers from Midlands at the Somabula Country Club. Government linked Gwesela to 21 other murders before he was killed leading to many Zanu-PF officials to flee the Copper Queen area in the province. The then Home Affairs minister said abortive attempts to capture Gwesela saw Government employing an offensive leading to the withdrawal of unformed security details from the area. The authority introduced an “invisible task force” but Gwesela became more vicious leading to the contact where he was finally killed. Gwesela’s reign of terror that had spread throughout the country when Zimbabwe was returning to peace after the dissident era saw authorities to put out a countrywide alert for his arrest and later a whopping Z$50 000 reward for his capture, dead or alive. The early stages of the manhunt, there was a mix-up in Richard Gwesela’s identity, but the police later clarified the situation after police discovered that another dead bandit had been identified as Richard Gwesela. Among Gwesela’s victims were prominent farmers and members of the uniformed forces. The Richard Gwesela story could have shaken the whole of Zimbabwe as it swept throughout the country but with effective follow-up of Zimbabwe’s security forces, it suddenly died a natural death. There are people today who do not know anything about Richard Gwesela and how his demise virtually brought peace to the Midlands province but the truth is the effective way Zimbabwe’s uniformed forces effectively deals with such insurgency. From Gaigusu, Tamborinyoka, Chidhumo, Masendeke, Chauke and several others who tried, albeit unsuccessfully, to breach Zimbabwe’s security, all met with the same fate while the people enjoy their peace. Myth or mystery, Zimbabwe still holds some intriguing stories to tell. Today, there is one mark in Richard Gwesela’s story: his mother and two sisters’ graves that lie unmarked at the homestead the notorious bandit was raised and Chief Gwesela and his people want to move on with their lives and forget the past. Just before you pass the well decorated chief’s palace on the right side of the Kwekwe-Gokwe Road, there lies three unkempt graves, where Gwesela’s mother lies with her secret of whoever fathered such a notorious character.